Here at Freightview we thrive on your feedback-- it’s what helps us become better and grow around your needs. We’ve gotten some great feedback regarding our Freightview bill of lading (BOL) and we wanted to clue you in on some of the changes we made. Customers who use our BOL across several carriers noted that is not easy to differentiate carriers when using the Freightview BOL. We have added the carrier’s SCAC in large letters across the top of the BOL. Now, just a quick glance at the BOL, and immediately know what shipments belong to what carriers. Not Familiar with Carrier SCAC Codes? A scac code is a Standard Carrier Alpha Code - developed in the 1960s by the National Motor Freight Traffic Association to help computerize carrier data, and later keep records for the DOT. Not each carrier’s code is easily identifiable; USF Holland for example, has the code HMES, while YRC’s code is RDWY. 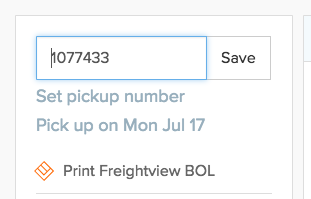 You can now edit your BOL number within Freightview. Simply by clicking on the number on the shipment page you can change the BOL number to whatever your heart desires. Keep your shipment info, BOLs, analytics, and quotes in one place with Freightview. Sign up for a free trial today.